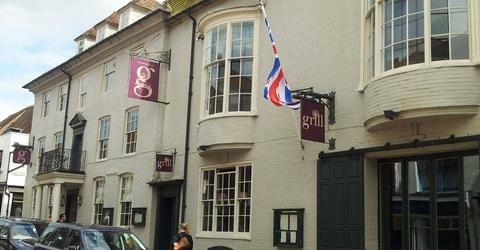 Dating back to 1575 The George is Rye's oldest coaching inn. It is situated on the quaint delightful High Street of this historically important coastal town. It is said that Napoleon's defeat at the Battle of Waterloo was celebrated here in great style and that Wellington himself stayed at the inn. More recently, however, a complete refurbishment programme has transformed The George into Rye's most luxurious boutique hotel. The interiors have been created by an expert hand and original features and highly polished antiques blend beautifully with contemporary colour schemes and furnishings. The bedrooms are simply spectacular. Each one is completely different to the next with themes inspired by Grace Kelly, the Art Deco era and New England. It's worth taking a look at the gallery on their website before making your reservation. All the rooms offer the highest degree of comfort with Vi-Sprung beds, Italian linen, marble topped baths and toiletries by REN. The food is equally spectacular and The George has an excellent reputation across the county. The food is largely locally sourced with much fresh fish appearing on the menu. The George Tap is a wonderful reminder of the inn's heritage and a great place to relax with a glass of French beer or wine!